I like to call this pattern Cameo Ballerina, since there has been speculation that it was named for the famous dancer Isadora Duncan, who passed tragically in 1927. 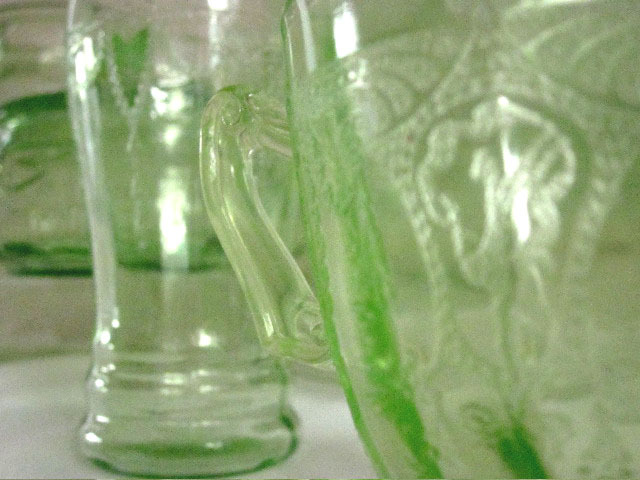 Whether you call it Cameo, Ballerina, or Dancing Girl, this pattern had its beginnings at the Monongha Glass Company, which was purchased by Hocking. The Springtime pattern of Monongha, was made with a mold blank and the pattern was hand etched. Hocking took the blank mold and the etching design to create a new mold called Cameo that was used in their automatic mold process. This became Hocking's first mold etched dinnerware. Cameo was made in green, yellow, pink, and crystal with platinum run. 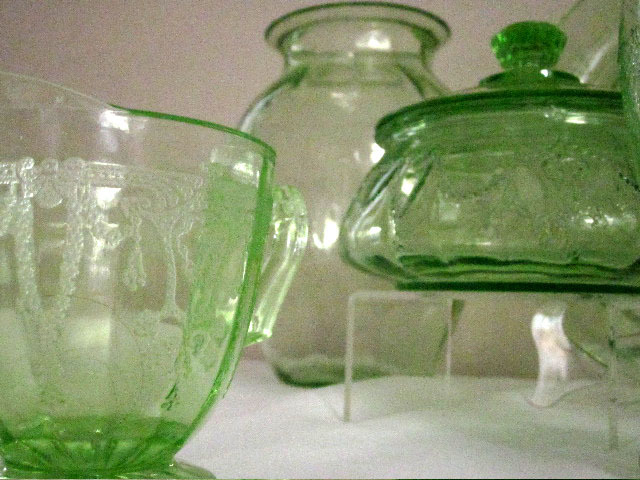 Green was the most widely produced color, and my favorite. 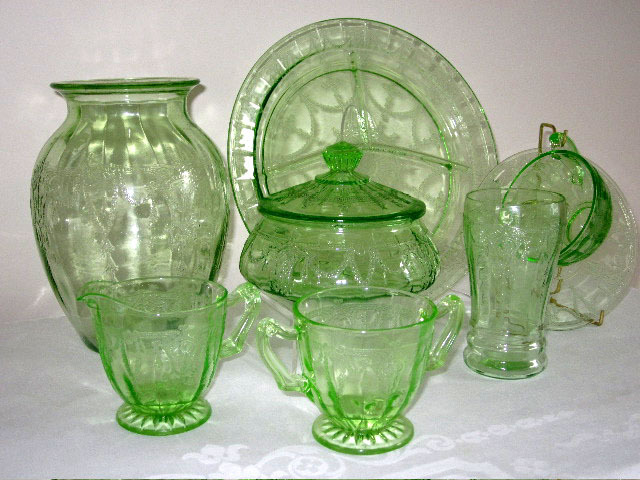 This pattern has many different pieces, so it is possible to build a set that includes plates, cups, saucers, glasses, pitchers, serving pieces, and decanters, as well as candlesticks and a vase. I have even seen coasters in this pattern. One day while I was playing with my dolls my neighbor came over with a box. 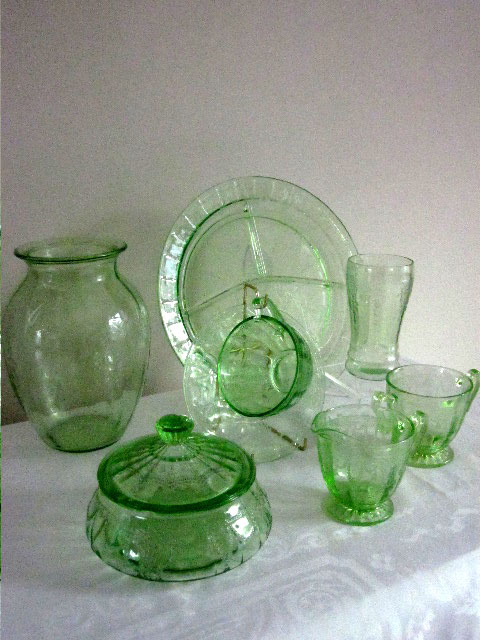 It was filled with beautiful green glass, and she said that she had received the glass as a wedding gift. She wanted me to put it in my "hope chest." I had no idea what a "hope chest" was, or what the glass was, but I went to an auction with my grandfather soon after and purchased a chest. I took the glass from the box and wrapped it carefully in newspaper and threw away the dusty old box. 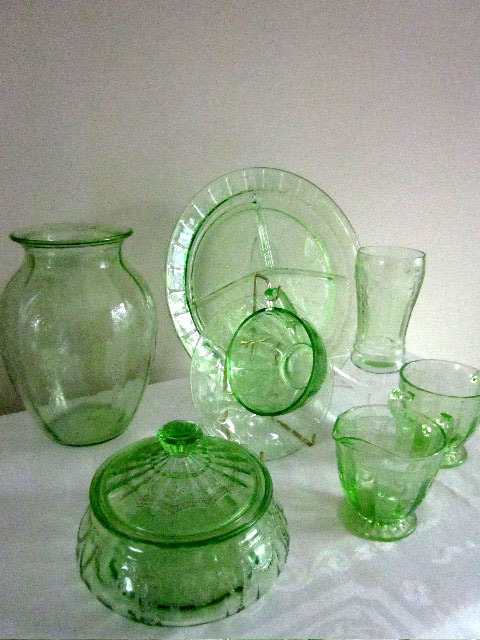 I continued to collect the beautiful glass, and inherited quite a bit from both my grandmother. By the time I knew what a "hope chest" was, it was quite full of glass, and I was taking it to my first home with my husband. What kind of glass was in the box? 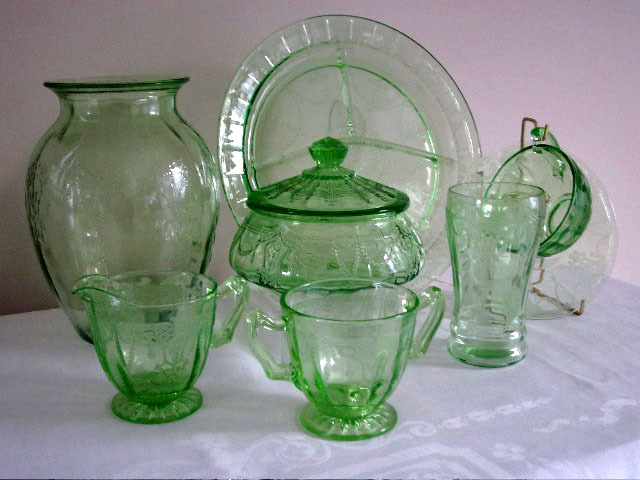 A luncheon set for four of green Cameo that included plates, cups and saucers, dessert cups with saucer, and glasses. Later I knew I should not have thrown the box away  lesson learned! I have added many pieces to the original set and use it on special occasions. Someday I hope to pass it on to a "ballerina" in my family. For now, it enjoys a special place in my china cupboard and my heart.